That’s why so many people turn to Green Lawn Fertilizing. We specialize in a variety of services that are valuable for those with unhealthy lawns, and we provide those services all throughout the year for very affordable prices. Liming – Liming is a great way to create a healthy lawn. When your lawn appears to be struggling with acid (which we can test with a free pH analysis), liming can add the base that will help your turf grow. Aeration/Seeding – Green Lawn Fertilizing will also prevent compacted soil through aeration, and fill in the holes with seeding. This will create deeper thatch that chokes out weeds and takes in more nutrients. 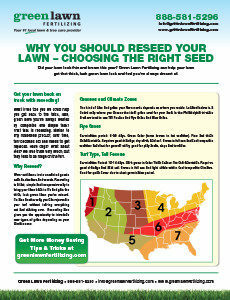 Fertilizing – Of course, our specialty is fertilization. That’s why we provide thorough 7 step fertilization support for any type of grass. Grass that gets the nutrients that they need will grow thicker and greener. Green Lawn Fertilizing is proud to be the leading provider of all of these healthy lawn solutions in the Pennsylvania, Delaware, and New Jersey area. Contact us today to find out more about all of our different unhealthy lawn solutions. You’ll find that no matter the state of your lawn, there is an affordable service we can provide that will enhance its looks and create a lush, green lawn in no time. One of the most important keys to a lasting, healthy lawn is aeration and seeding of your turf. Here’s why you should consider paying a professional instead of doing it yourself. With proper seeding, you can transform a lawn from wimpy, patchy and brown to thick, healthy, and green. Sign up for a Lime program and receive $10.00 off your first application. For new programs only. 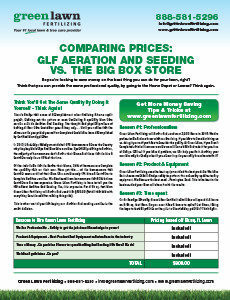 Receive $100.00 off the regular price for aeration & seeding. For new programs only. Cannot be combined with other offers. An unhealthy lawn can prove major reason behind disease. Its very imperative to keep the lawn clean and green. Provided ways will surely improve lawn health also, it is much easy to follow. Thanks for sharing. Nice tips and info. I agree that there’s nothing worse to look at than an eye sore of a lawn!